(18), Khun Phaen House (19), Rattanakosin Dwelling (24). 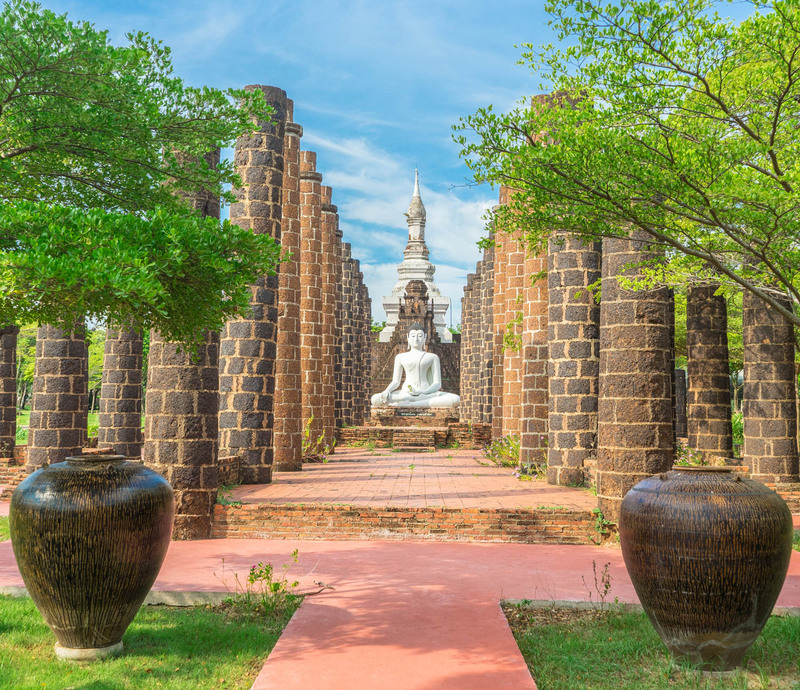 As for stone towers there are Prasat phra Wihan (Preah Vihear), Si Sa Ket (72), The Phanom Rung Sanctuary, Buri Ram (87), The Phimai Sanctuary, Nakhon Ratchasima (86), Prasat Sikhoraphum, Surin (90), The Fruit-shape Tower (Prang Mafuang), Chai Nat (32), Prang Sam Yod, Lop Buri (35), Prasat Sadok Kok Thom, Sa Kaeo (93), the essense of the Northeastern Historal places. 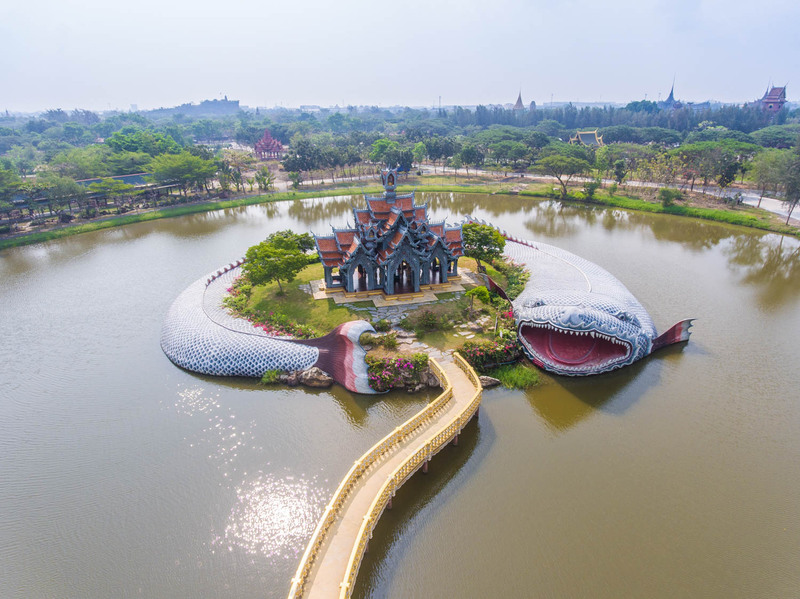 Other masterpieces were also built during this period such as The Garden of the Gods (43), The Bench of Public Appeals, Sukhothai (48), Noen Prasat, Sukhothai (49), The Grand Hall of Wat Maha That Sukhothai (50), The Hall of Wat Nimit, Trat (95), Ho Kham, Lampang (53), Phra That Phanom, Nakhon Phanom (71), Phra That Bang Phuan, Nong Khai (66), Phra Chedi Si Song Rak, Loei (63), Phra That Narai Cheng Weng,Sakon Nakhonon (69), etc. 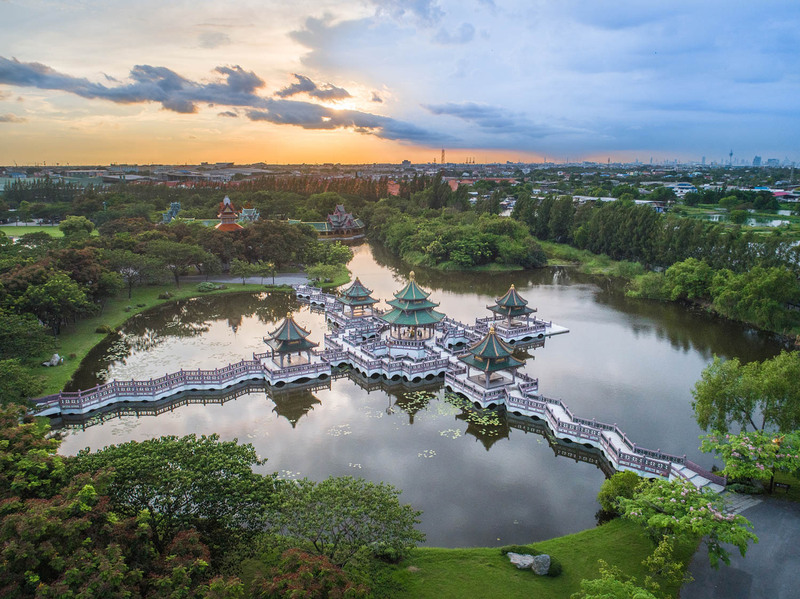 The second phase of building the Ancient City is a development under Mr.Lek's vision, he travelled and brought the ruins in each regions and does not rely on the architects to draw up the blueprint anymore. He gathered wooden buildings from all over the country that contains historical, social, and cultural impact and kept them in shape at the care of the Ancient City. 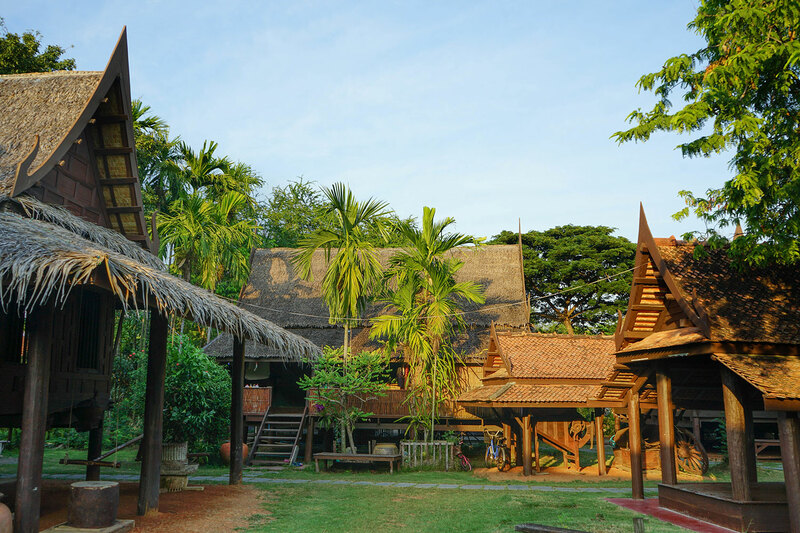 The wooded dwelling is a true sign of community of Thailand, not only it is made of rare resources, the temples and homes were built according to each regions needs. 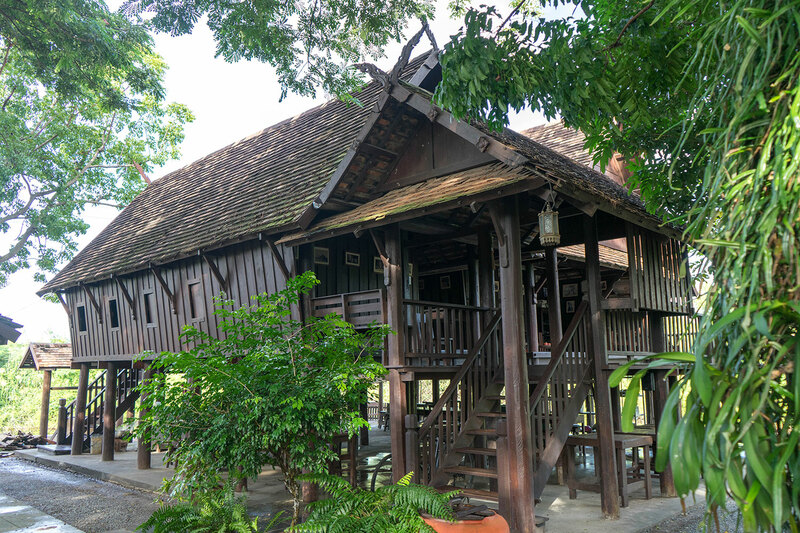 Until concrete were popularly used as building material, resulting in the wooded buildings to be neglected, Mr.Lek preserve these wooden houses by taking them to the Ancient City and kept them well for the people of next generations to see. These architectures includes the Floting Market (45), The Wihan at Wat Phrao, Tak (46), The Old Market Town (10), which is all the way of life of Siam in the past, as of a showcase of economic activities and social interactions, which shows the various cultures, beliefs, in the same area of dwelling. These dwelling are mostly made from wood and were taken from all over the country including: The Thai Hamlet from the Central Plains (38), The Northern Thai Village (60), Wat Chong Kham, Lampang (55), including The Phra Kaew Pavilion (30) which was created from the image of a drawing of the wooden box. Other than this some ruins were recreate here such as The Wihan at Wat Phra Si Sanphet, Ayutthaya (25), The Gateway of Wat Pho Prathap Chang,Phichit (39), The Garden of Sacred Stupa (92), The Ancient Theatrical Pavilion (94), these show the civilization and the ruins of it at the same place. 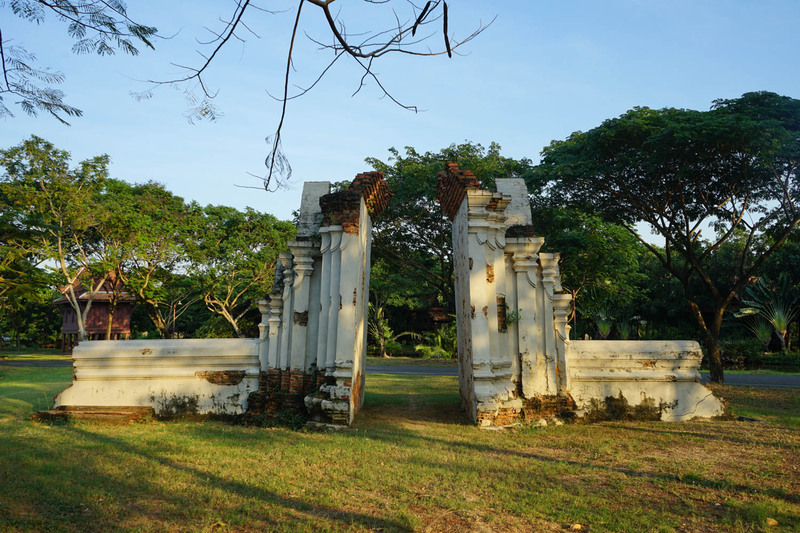 During a 10 yers period Mr.Lek set out to every region in Thailand to collect and find information to build the Ancient City, the rich History knowlege that he retained has changed the original plan of creating a recreational space, into a open museum, to promote the understanding of Geography, arts, life, social, and cultural circumstances of Thailand, and here at the Ancient City, everything is collected at one place. 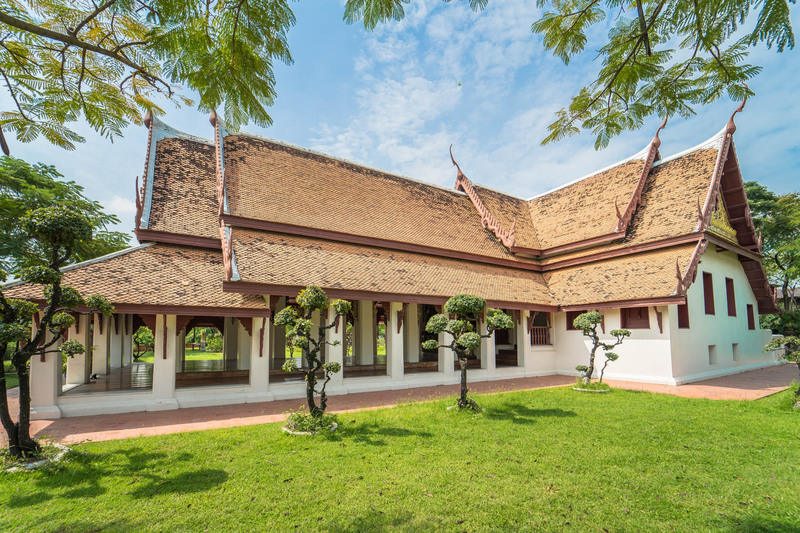 In 1981 Mr.Lek Viriyaphat has continued his jorney and started the Sanctuary of Truth, after the Thai Style Cinema in the Ancient City was completed. His knowledge from building the wooden architects and his interests in philosophy, pushed him to explore the meaning of life, through religion and spiritual practices. Currently, the Sanctuary of Truth is the largest wooden building in the world, and was carried on being built by the second generation of the family. 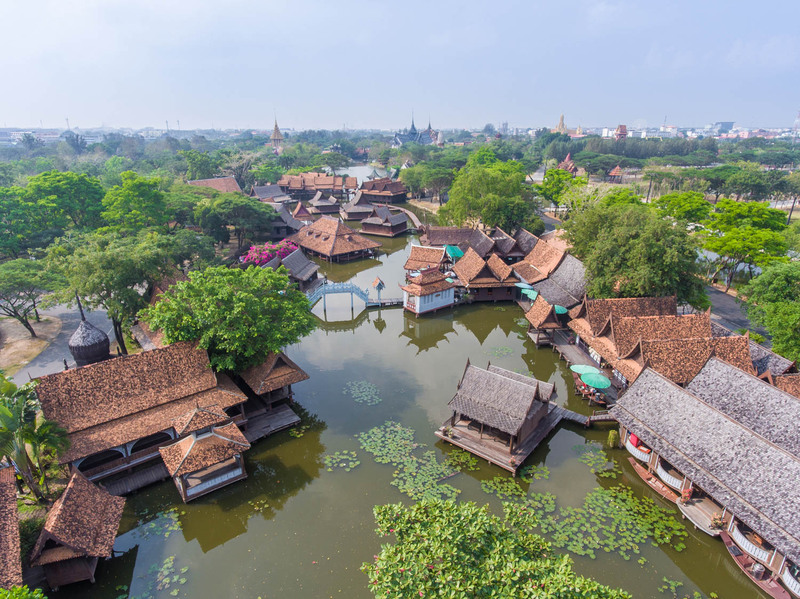 The places in this era were built from the knowledge, wisdom, and imagination of Mr.Lek Viriyaphant, which could be counted as a signature style in the Ancient City that could not be found anywhere else. Since it is all a complilaition of his whole life's experience. 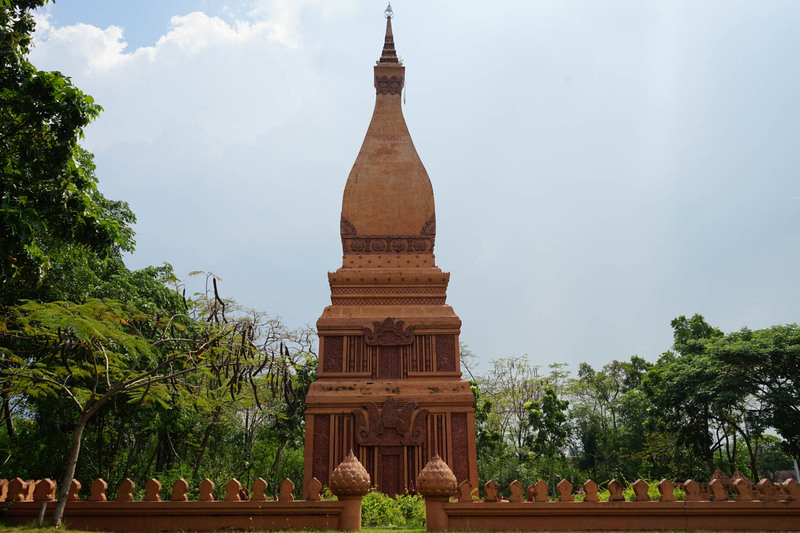 Mr.Lek built things that are conincide with Thai religions, customs, and its specilaty. The space has a green area and pavillions for resting all around. 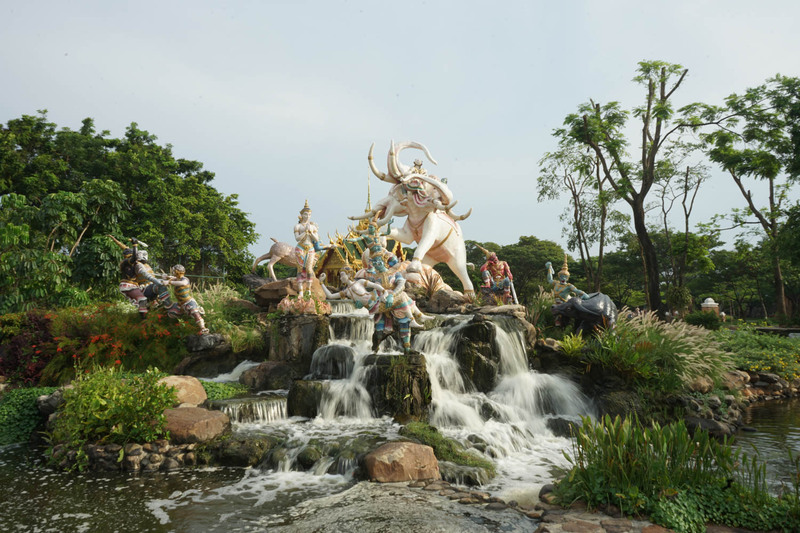 Including ones with water surrounding such as Botanical Garden from Thai Literature (109), Sala of Ramayana (107), Sala of 80 Yogis (103), Sumeru Mountain (102) He especially created things that the modern days Thai people doubted and put them into artworks, in the past these were the stories that wish to teach people basic morals and beliefs such as Sumeru Mountain (102), Mondop of Bodhisattva Avalokitesvar (Kuan-Yin) (105), Pavilion of the Enlightened (110), in which the Pavillion of the Enlightened is so intricate, the construction is not yet completely done until today. 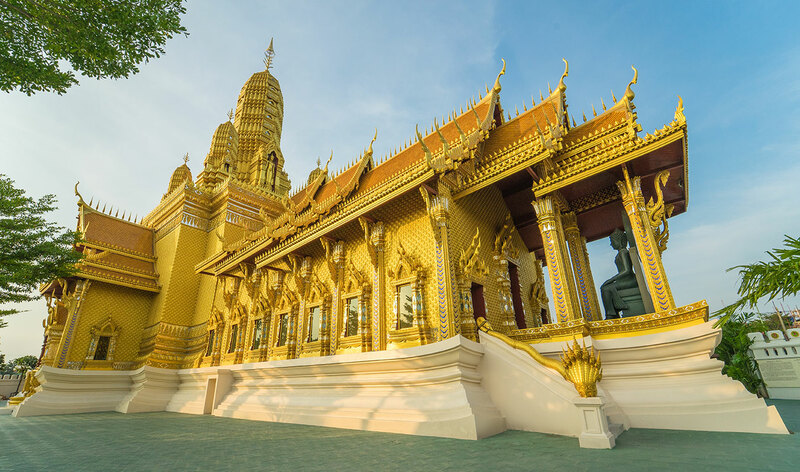 Other creations includes Phra That Mondop (108), The Royal Water- Course Procession (104), Sala of Ten Reincarnations (100), Sala Kong-Ming (Zhu-ge Liang's Pavilion) (115), Sala 24 Katanyu (Pavilion of Icons of Gratitude) (114), Thai Sail Ship (113) In 1994 Mr.Lek Viriyaphant pass on his burden to his eldest son Mr.Pakpien Viriyaphant with the task to build Erawan Museum to collect all the precious artifacts of Thailand. 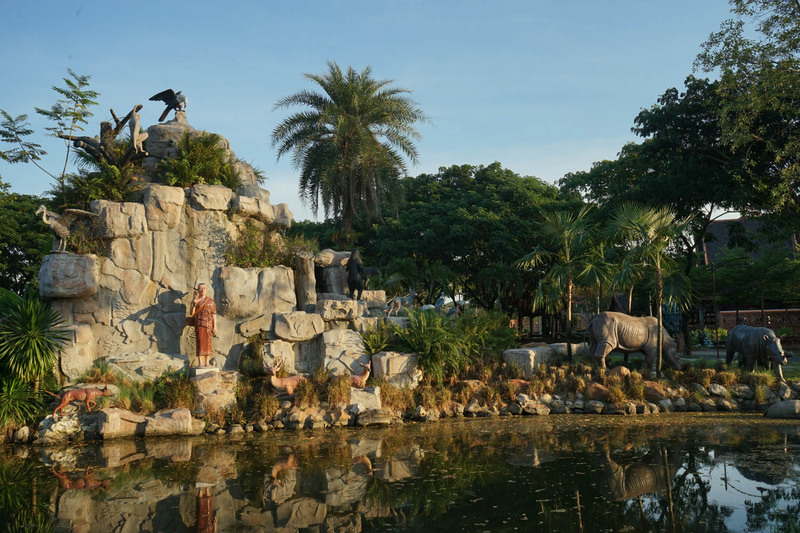 Mr.Lek had the sculpture designed after his own vision and wish for the belly of the elephant to be the hall in order to showcase the artifacts. Today the Erawan Meseum has become a safeguard of all the important artifacts and an important shrine for people to come and wish for luck and protection. The beautiful structure is definitely a heritage and a representation of the spirits of those who came to pay their respect. 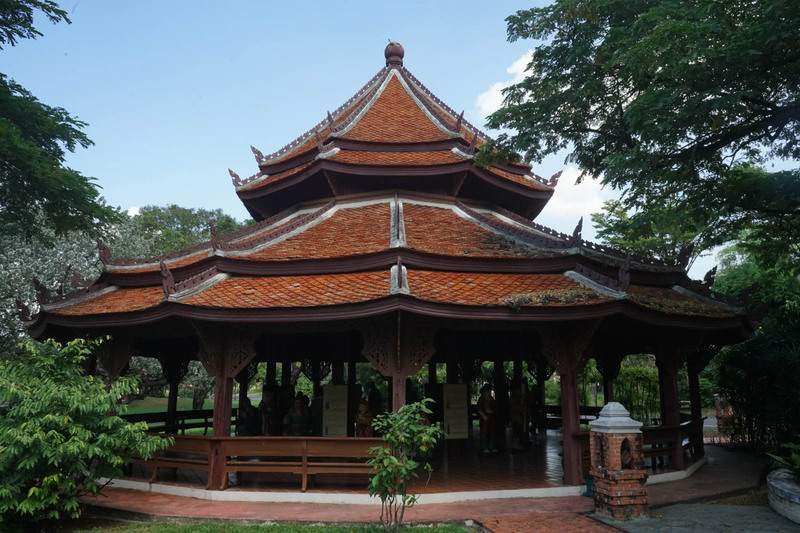 After Mr.Lek Viriyaphant passed away in 2000, the Ancient City was getting old due to its age, all the masters whom has been a part of the building and upkeeping had a dicussion about the continuation of the Ancient City. The fact is that the keeping-up process may be even harder than the building process itself. Not only so the upkeeping of the whole area would cost even more than rebuilding it. Therefore this was the era of restoration, all the arts were restored and rebuilt upon the same grounds, to make them as original as possible. 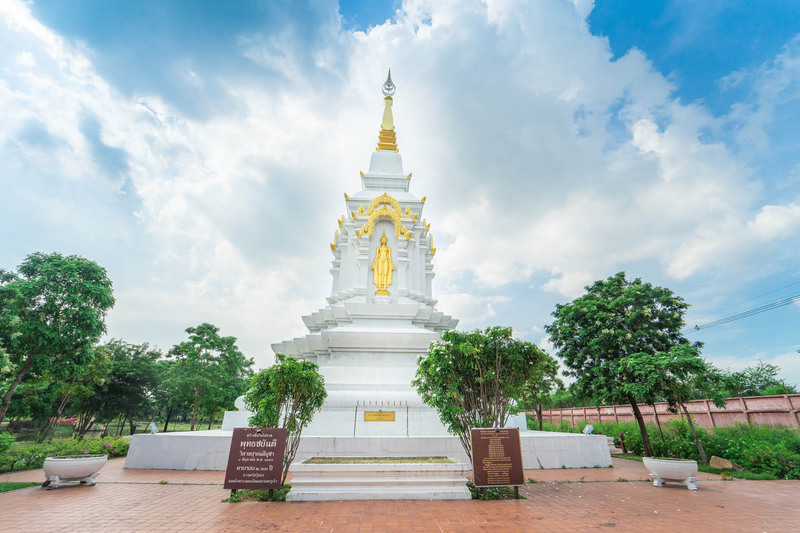 Other than this Erawan Meseum is finally finnished and open to the public when Mr.Pakpien Viriyaphant passed away in 2002, this again became a pivot time of the Ancient City and which direction it will take that will be the most sustainable. 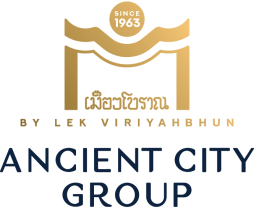 The Ancient City is the world's largest private musuem in the world that has been in operation for over 50 years under the vision of Mr. Lek and Ms. Prapai Viriyaphant's vision of "The culture as a mission". 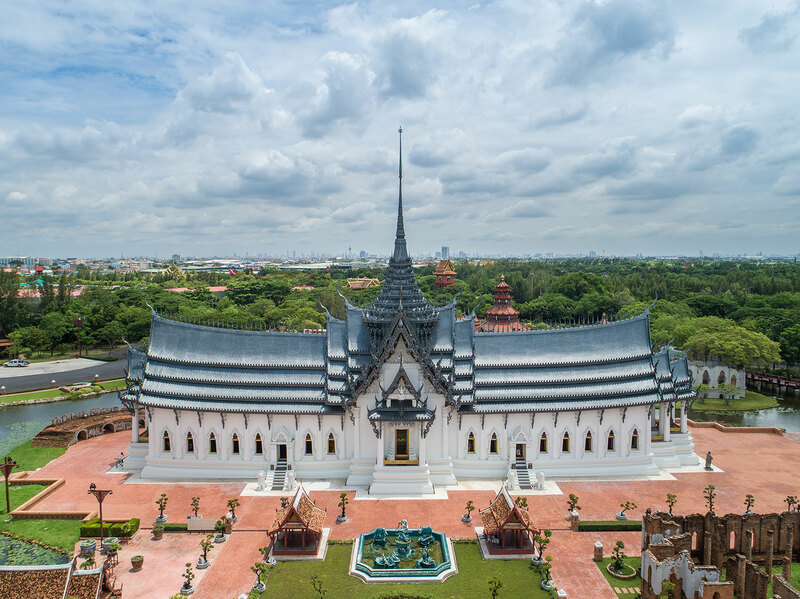 Through everything that they had been through their decendants has seen the importance to kept their vision alive and to keep the three important places that has an impact on Thai preservation of culture, and they had kept investing in hopes to continue this great effort to preserve Thai culture. 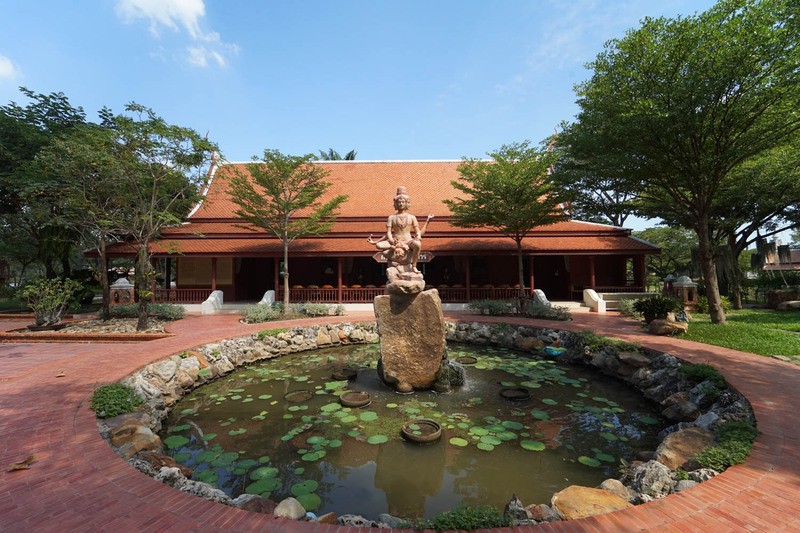 However develop Science and Technology becomes and replacing the labor workforce, the arts, architects of Siam is something that could not be achieve by these new technology could not replace the arts these masters acquired. From the beginning of 2017 until today, we had been able to keep the fame artists the has lineage traced back to the olden time here. 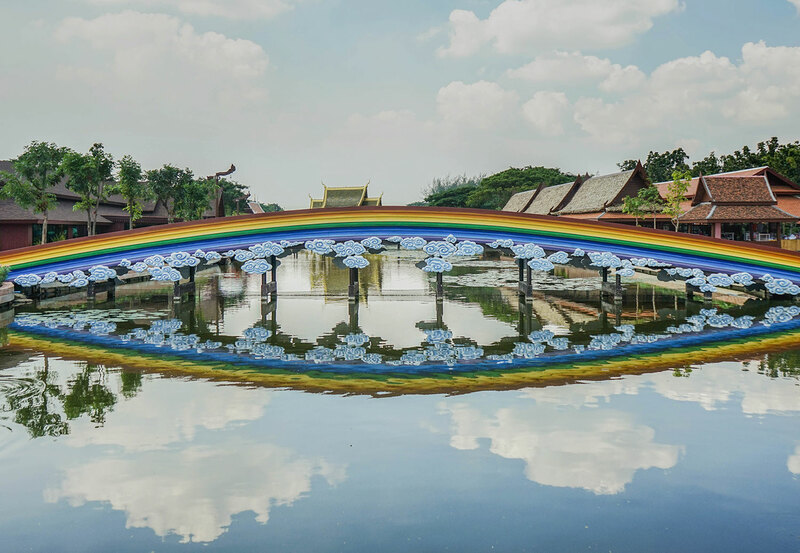 These art master has a deep understanding of Bhuddism that is hard to see in works today, such as The Ancient Chaisri Bridge(111), The Great Vajiradhama Temple, Thai Pavillion, Aiyawas Pavillion, Mahakassa Pavillion, Khaoyai (120), Dragon Boat Pavillion, Phrom Viharn (108), Bhumi Siamtevatirach, and other architectures that the Ancient City has built in addition. This is to bring the knowledge that we aquired throughout the years to use as a basis and to keep the spirits of the true master. Build things to commemorate the History of Thailand.